I saw an article on ANN about this manga, and that people apparently wanted an anime adaptation of it. I can honestly say, I have no clue what I just read. It was confusing, odd, weird and the art was also pretty strange at times. I had times I laughed, and there were times that I enjoyed the story, but all in all, I don’t think I will be reading more of this one, or watching it should it ever get an anime adaptation. The main problem is just the weird story line, the apparent superhero that is Sakamoto. Why is Sakamoto fast? Why can he do all these things without batting an eye? Is he a superhero? Is he magical? Is it something else? This volume doesn’t really say, and so it is quite awkward to see Sakamoto do all kinds of things at lightning speed. It makes it all unbelievable and I was just rolling my eyes and the obvious: OMG SAKAMOTO *swoon* stuff that all the girls and also some guys did. 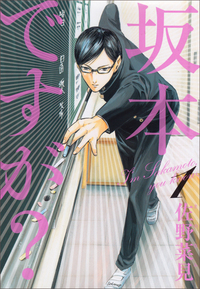 Each chapter features a bad guy (or guys) and how Sakamoto deals with them. I don’t mind monster of the week stories, but give us some backstory. Don’t just dump superhero Sakamoto on us without explanation. The art is also pretty horrendous. Characters looking ugly, making weird expressions and having weird proportions. I didn’t like it, and at times I just skipped from a page because of this. At times Sakamoto is draw as a real hottie, but other times he is just scary/creepy/ugly or something else or all of the above in one. Would I recommend this one? No. Not at all.